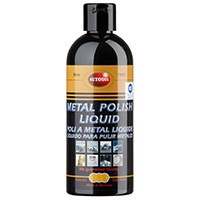 Liquid Metal Polish, 8.4 oz (250 ml) Bottle Ideal for Brass and Copper Alloys - Contains No Ammonia. Cleans and Removes Plastic Build up, Dirt, and Corrosion. Provides a Brilliant High Gloss Finish.